The government has set out its plans for the development of health service. Health Secretary John Reid outlined the proposals in a statement to the House of Commons. He said the waiting time from GP referral to operation would be, at most, 18 weeks by 2008. He also said patients would be able to go to any facility in England that meets NHS standards and can provide treatment at NHS prices. Tory health policies outlined this week also include a pledge that patients could choose to be treated at any hospital. However, they also promised to give patients who choose to go private, 50% of the cost of the operation on the NHS. The government has pledged to spend billions more on the NHS. Total investment by 2007/8 will be £90.2bn, compared with less than £80bn this year. The Health Secretary told MPs that the extra money would be used to provide a better, more personalised service for patients. By 2008 no patient would wait for more than 18 weeks for treatment after being referred by their GP, he said. When people fall ill what they want is timely diagnosis and fast treatment close to home. The average wait would be around nine to 10 weeks. At present, waiting times are only measured from the time of diagnosis, to the time of treatment. The current target for this period is nine months. The government also said the private sector would increase its involvement in providing NHS care, carrying out up to 15% of operations and diagnostic procedures. This could mean independent sector hospitals and clinics carrying out around a million operations a year - an increase from about 250,000 by the end of next year - plus perhaps thousands of other diagnostic procedures. The Department of Health is also expected to shortly announce a new contract to provide more MRI scans in the NHS, with a private sector provider supplying a mobile cancer screening service. Earlier, Mr Reid told the BBC: "The patient considers the journey right from the time he first sees his GP through to the door of the operating theatre. "I believe that with the increased capacity we are putting in, and the reform, and the efforts of the staff we can come down from the years it was under the Conservatives for the whole journey to a matter not of months, but some weeks." Mr Reid also outlined plans for a new emphasis on treatment of people with chronic health problems. Community matrons will be introduced to co-ordinate care for people with long-term conditions such as asthma, arthritis and diabetes which affect around 17.5m people. The government has pledged to cut death rates from coronary heart disease and strokes in under 75s by at least 40% by 2010 compared with 1997. Death rates from cancer in should be cut by 20%, and suicides by 20%. "Significant reductions" in rates of the MRSA superbug by 2010 were also promised. Mr Reid said: "It is an improvement plan to ensure that the greatest gift ever from the people of this country to the people of this country, our NHS, will not only retain its basic fairness and equity, but will be able to meet the expectations of all our people in this new century." Shadow health secretary Andrew Lansley accused the government of a "pig-headed" obsession with targets. He said: "No one in the NHS tells me they need more targets. "They tell me they need less bureaucracy, fewer targets, more autonomy and more resources reaching the front line." 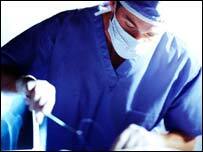 Paul Burstow, Liberal Democrat health spokesman, added the targets would "tie the hands of doctors and nurses". He said: "When people fall ill what they want is timely diagnosis and fast treatment close to home." Health is expected to become a key battleground in the next general election, which could be less than one year away. Which NHS vision do you want?